As we’re still in the midst of Chanukah it seems appropriate that the first recipe I share is for potato latkes. 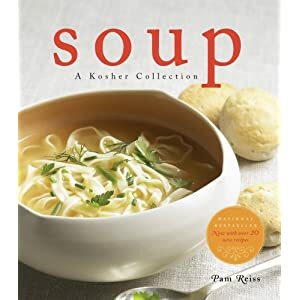 There are so many recipes out there – and many of us use the same recipes and techniques that have been passed down in our families for generations. My recipe is nothing new – but I like the results. Use a box grater to grate vegetables. If making large quantities, use a food processor. Squeeze as much liquid from the vegetables as you can. Grating the onion first, then tossing the potatoes with the onions as you grate them will help keep the potatoes from oxidizing and turning that blueish grey that is so appealing. Use a non-stick or cast-iron frying pan for frying. Heat 1/2″ of canola or vegetable oil over medium (350 degrees). The oil should be hot enough for the latkes to sizzle and bubble as soon as they touch the oil, but not too hot or they will burn before they are cooked through. Serve with apple sauce, sour cream, creme fraiche or tzatziki. Grate the onion and potato, drain and place in a mixing bowl. Add the eggs, flour, salt and pepper and mix well. 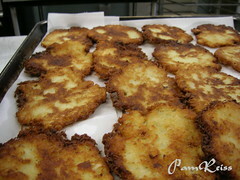 Heat oil and use two spoons to place batter gently into the oil (use about 2 T. of mixture for each latke). Fry for about 4 minutes, or until the edges start to brown, then turn over and cook another 3-5 minutes until both sides are golden brown. Transfer to paper towel, drain and enjoy. hey pam, nice to see you blogging (i know you from eG … surprise! lol). mazal tov on your blog. i’m going to link you. thanks for linking me up to yours. 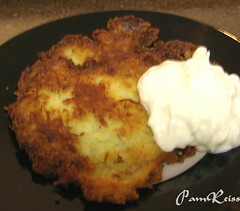 i’m also going to include this post for the one i did for a slew of latkes. these look great as does all your food. 🙂 belated happy hanukkah wishes. Thanks for stopping in! And linking, and posting. Your blog is fantastic and I’ll happily continue to read it.